Bringing the distant desert song and atavistic blues of sub-Saharan Africa to a wider audience, the much venerated (especially at the Monolith; with three of their releases making last years ‘choice list’) world music label, Glitterbeat, once again unearth another stunning talent. 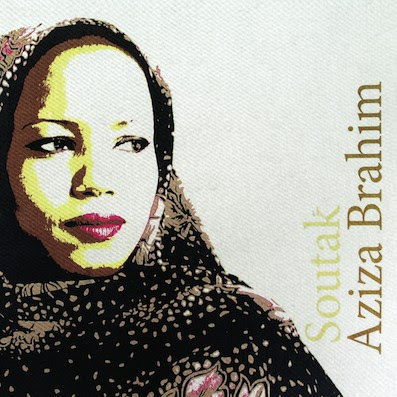 Born in the hardened landscape of a Saharawi refugee camp on the boarder of Algeria and the Western Sahara, beguiled vocalist Aziza Brahim embodies the wandering spirit of her people; their settled, though often borderless and disputed lands, previously claimed by Spain, were invaded in 1975 by Morocco. Though made up of many tribes with many different goals the Saharawi people did mount a fight back. It was in this climate that Brahim was hewed. Her travails have extended to Cuba – where she was educated as a teenager – and Barcelona – where she now resides. Absorbing on route the sounds of French North Africa and her new Spanish home, Brahim’s first album for Glitterbeat is still unmistakably rooted in the heritage and soul of the desert. Much of the material on this album is intrinsically linked to it; either in protestation or in tribute – the sauntered rhythm rich ‘Julud’ is dedicated to Brahim’s mother. Soutak, or ‘your voice’, is cantered on just that. The backing is striped to a degree, so the poetic reverberated vocals can echo and warble soulfully without interruption. Though there is no mistaking that strong, robust and primal Saharan spirit, the congruous accompaniment is a mix of both Balearic and folk rock styles – especially the deep sleek, bass guitar notes, which slide and weave under Brahim’s distinctive voice. Produced by Chris Eckman (of Dirtmusic fame), whose assiduous talents have done wonders with Malian blues rockers, Tamikrest and Bamako Afrobeat artist Ben Zabo, Soutak was recorded live in Barcelona: the fluid lilting cosmopolitan sound of that city is unmistakable. Active since 1992, the purest adroit German jazz label, ACT, has continued to release a litany of understated projects by some of the genres most accomplished players and composers. Through sagacious ‘choice’, the intuitive label has collected and then showcased an envious rooster of modern jazz from around Europe: from the Sweden to the Czech Republic. Introduced to its charming, and impressively tentative, nature a couple of years back, I’ve been inundated with one erudite release after another to review or feature. 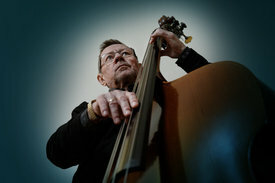 Last week it was the nuanced classical imbued fusion of Gwilym Simcock & Yuri Goloubev’s Reverie At Schloss Elmau this week it’s the turn of the understated, Emil Viklický and his fellow Czech countryman, bassist supremo, George Mraz. 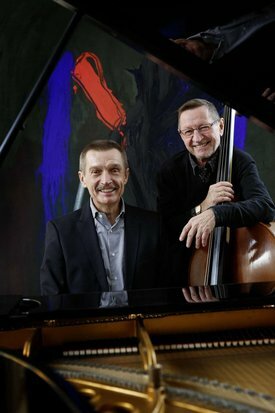 Stalwarts and instigators of the Czech scene, during the iron curtain years and post, Emil Viklický and George Mraz not only both studied at the esteemed Berklee Collage of Music in Boston, but also earned their chops with another celebrated Czech jazz titan, Karel Velebny (of the famed SHQ Ensemble). Though following different pathways to their goals, they first crossed paths at a 1976 festival in Yugoslavia, and reunited years later in Prague. Attracting accolades and prizes over a forty plus year career, mathematician student turn prodigal pianist, film composer and teacher, Viklický, and his natural bedfellow of similar poised panache and skill, Mraz – credited with playing on almost a 1000 records by a worthy litany of jazz greats – have synchronized perfectly on their debut release for ACT, Together Again. Enjoying the stately years, with both men now well into in their late sixties; their genteelly caressed and romantic alluded performances on this collection of eleven instrumentals prove undoubtedly reflective. But this is in part a lively if subtle spread inspired by a desire to transduce the heritage and ‘modal’ qualities of the Moravian folk music they’d both grown up with and held so dear. Coupled with peaceable and dreamy interplay, the duo flows rather than probe a melodic landscape of ‘swinging post-bop’ serendipity (‘In Holomóc Town’) and eloquent delightful balladry (‘Moon, Sleeping In The Cradle’). Another of those lyrically meditative ballads, ‘Poem’ – accredited to 19th century Czech composer, Zdenĕk Fibich – skips along like a ponderous Slavic version of Bill Taylor & Richard Lamb’s ‘I Wish I Knew How It Would Feel To Be Free’. Sadly mournful, ‘Austerlitz’ is either a meditation on the famous Napoleonic battle (one of Napoleon’s most famous turned-around victories) or the W.G. Sebald novel of the same name. It is however a simmering soundtrack of ebbing sustained bass notes and sleek tinkling piano; contemplatively moving along at a perfectly held pace. A more relaxed return to the archetypal jazz of the cocktail and smoky valeted club of the late 50s is in evidence on ‘Thank You, Laca’ (another adaptation and re-arrangement of the old Czech guard, accredited to ‘folklorist’ composer, Leoš Janáček) and ‘A Bird Flew By’. As you’d expect from the ACT label, a masterful performance, as two of Europe’s modest greats connect once again. 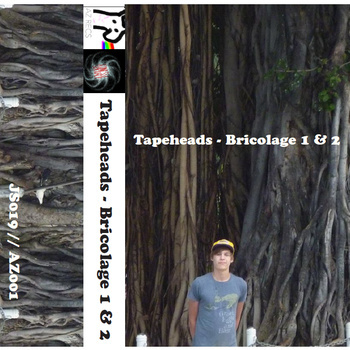 Originally a moiety of EPs, both this volume and its predecessor, Bricolage I, have been congruously united under the banner of Larose’s first ever album proper and released in a joint operation by Zebra Records and Montreal-based label, Jeunesse Cosmique. An album of two halves, with the second showing off – if indolently and masked in a haze of snatched dialogue and vapourous slacker lament – our bedroom troubadours attempts at songwriting. Homely and distantly lost in a vortex of lilting fuzz, these songs seem more like sketches than thrashed out ideas. Though the interesting, and at times evocative, presence of a good melody, riff or tune always comes through, even if it’s only for a few seconds. Part one (that’s the part we’ve not reviewed before) is even more curious; a tripp-y trail through Cajun swamp funk (‘Acouphène’), echo-y haunted environments (‘Teniamos’) and Mogadon induced ambient kick drum passages (‘Viens içi mon ami’). Without doubt his own man, Larose evokes – distant, as they might be – cursory moments of the less lumbered and lo-fi Mercury Rev, Beck and TV On The Radio – more like TV on the blink! Again, this may all be too deep for what is essentially the daubing’s, meanderings and passing interests of an outsider artist. But then again, again! We could be witnessing the lost tape testaments of a genius.